Walk up to a wall of HDMI cables at your local electronics store or browse your online outlet of choice and you’ll see all manner of brands claiming their cables offer better picture and sound quality than the competition. Indeed, there is perhaps no consumer electronics segment more riddled with marketing voodoo and misinformation than the cable and wire industry. It’s nearly impossible not to be coerced into spending premium dollars in the pursuit of the best possible experience. But is there really a difference between expensive HDMI cables and budget offerings? We asked an expert to find out. So the short answer is no. If you think a more expensive cable is going to deliver a better picture, then you’re mistaken. What are the HDMI certifications? If you have a High Speed HDMI cable then you’re set for watching anything up to 4K right now. That means that existing High Speed HDMI cables, which should always be labeled as “High Speed,” both on the packaging and the cable itself, can handle 4K content at 60 frames per second. If you’re buying a new 4K TV and you already have a High Speed HDMI cable, then there’s no need to buy a new one. “People don’t realize, but we actually supported 4K at up to 30fps back in 2009,” says Park. If you have a High Speed HDMI cable then you’re set for watching anything up to 4K right now, and the price is not going to impact the picture quality. But are there other, valid reasons for spending more on a cable? “There are major durability differences between different cables and many manufacturers offer additional features, beyond the ability to carry an HDMI signal, that could add value and cost” says Park. There might not be any real benefits in terms of audio or picture quality with an expensive HDMI cable, but here are a few reasons that you might consider spending a little more. HDMI does have a dedicated compliance team that polices the industry. They even shut down some exhibitor booths at CES over licensing issues, and they work with big retailers to ensure all the products they offer are genuinely HDMI compliant. Still, there’s always some risk that fakes can slip through into the market. 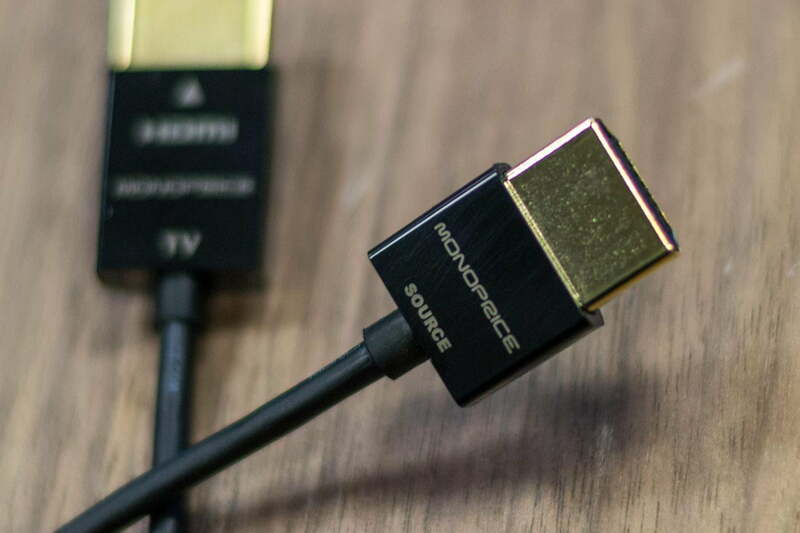 “Some cables are active cables, particularly thin or long cables,” explains Park, “and they have active electronics on one side or both sides of the cable to help boost the signal and maintain integrity.” Monoprice’s Redmere cables are a good example of an active HDMI cable. Longer cables are inevitably going to cost a little more, and they are becoming more common as more and more people wall-mount their TVs. Thin cables are more portable, so they’re popular with laptop owners, but the thinner the cable is, the more difficult it is maintain signal integrity, so they employ active technology which adds to the cost. “There are some HDMI cables out now that will upscale 1080p to 4K,” says Park. That means you can plug an HDMI cable into a 1080p Blu-Ray player at one end and a 4K TV at the other end and it will scale up the image. Manufacturer’s claim it does a better job of upscaling the content than the TV can on its own. These cables may require a USB port to draw power. Durability If you’re unplugging and plugging in your HDMI cable frequently, then you may find that cheap cables don’t last as long. There can also be issues with wall mounted TVs where a cable is held at a right angle or has constant pressure on it. In these cases you may prefer something a cable with a more robust strain relief, or brawnier build quality. Warranty Some cable manufacturers offer an extended or lifetime warranty. If you want a cable that will last, or one that you can get replaced easily should anything go wrong, then you should plan to pay a little more. Status symbol You may not think of a cable as a status symbol, but if you gold-plate just about anything, people find it a more attractive option. Some folks want to buy the most expensive item available, regardless of whether it offers any real benefit over a cheaper option. You can check out HDMI’s website for more details about what to look for, and there’s even a finding the right cable guide available. Stick to reputable retailers so you can return anything sub-standard, and check for positive reviews, but you shouldn’t really need to spend more than, say, $10 for a 3-foot cable.